FIRST VISITED Portugal’s Vinho Verde region in 2008 and found the wines polarised. One sort was what most people think about when Vinho Verde is mentioned: a bright, light, white wine with low alcohol, searing acidity and a slight spritz. The other sort represented the wines being made by a small band of quality minded producers such as Soalheiro, Covela and Ameal, who were looking to make more serious wines from riper grapes without any spritz. Examples would be Soalheiro’s Alvarinhos, which had quite a reputation for developing with age, and the Loureiro-based wines of Quinta do Ameal. At this time, there were very few wines that didn’t fall into these two categories of cheap spritzy or high-end bottlings. I visited again recently and found things have changed considerably. A new style of Vinho Verde is emerging and it seems to be resonating with the demands of the market. These are single-variety Vinho Verdes without the spritz, and with alcohol levels more in line with dry white table wines from elsewhere. 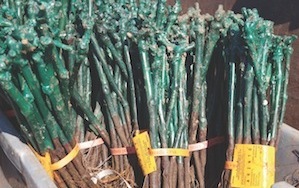 At the moment, the supply of varietally labelled bottlings of the region’s most famous variety, Alvarinho, is limited because only wines from the Monçao and Melgaço sub-region are allowed to put the name of the grape on the bottle. This is keeping prices high because of the demand/supply imbalance, but as the rules transition and other sub-regions are allowed to label their Alvarinhos varietally this should bring prices down a bit. In the meantime, leading the single-variety charge are Loureiro, Arinto, Avesso and Azal. “Of these varieties we’re seeing a premium starting to develop for the Avesso grape, which is only planted in the south east of the region, on the Douro river, predominately in the Baião region,” says Oakley.